Danish brand ECCO announced today the signing of Marcel Siem, who is a fan of the company and specifically the Tour Hybrid shoes. He will wear ECCO shoes and showcase the ECCO logo on his headwear. The German will join a stable of stylish players already striding down the fairways in ECCO shoes. Players such as Fred Couples, Graeme McDowell, Thomas Bjorn, Thongchai Jaidee and Stuart Appleby. Why do so many players wear Ecco shoes? Thomas Bjorn says "I wear ECCO, because I rather worry about my swing than my feet." 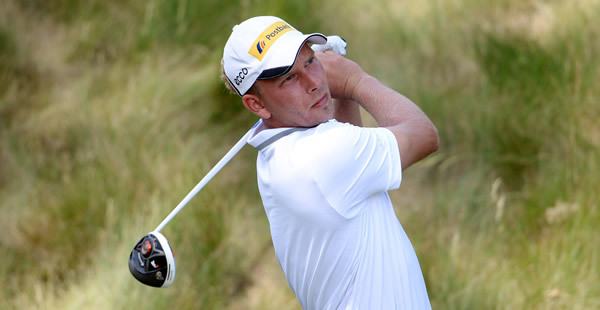 A three-time winner on the European Tour – including this year's Trophée Hassan II – Siem is currently ranked No. 58 in the world. The 32-year-old plays all across the world, including a significant number of PGA Tour events. The ECCO Tour Hybrid, released in December 2012, is a crossover shoe combining traditional, refined looks with a casual, spikeless sole. You may have seen it on the feet of Graeme McDowell. Read our review of the ECCO Tour Hybrid Shoes. Other recent Ecco shoes include the ECCO BIOM, BIOM Hybrid and the BIOM Zero. ECCO re-sign Fred Couples three days after Graeme McDowell wins the French Open.